Difference between revisions of "Supercapacitor"
Redox pseudocapacitance: This occurs when ions adsorb on or near the surface of the electrode with an accompanying transfer of electron(s). One example of a system that displays such behavior is hydrous ruthenium dioxide (RuO<sub>2</sub>*nH2O) in acidic solution. In this example, the charge storage mechanism is explained by the simultaneous insertion of electrons and protons into the structure, causing the oxidation state of ruthenium to shift between Ru<sup>4+</sup>, Ru<sup>3+</sup>, and Ru<sup>2+</sup>. 1 What is a supercapacitor and how does it work? What is a supercapacitor and how does it work? A supercapacitor (also called an ultracapacitor or electrochemical capacitor) is a type of electrochemical energy storage device. It is superficially similar to a conventional capacitor in that it consists of a pair of parallel-plate electrodes, but different in that the two electrodes are separated by an electrolyte solution rather than a solid dielectric. Usually, but not always, the two electrodes are identical, and an ion-permeable separator is placed between them to prevent them from touching each other and creating a short circuit. When a voltage is applied across the device, positive charge collects on one electrode and negative charge collects on the other. For conventional capacitors, this is the end of the story. 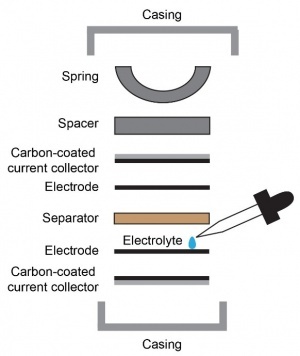 However, in a supercapacitor each charged electrode will attract oppositely charged species from the electrolyte solution which balance the charge of the electrode. The species that adsorb directly on the electrode surface form what is called the “inner Helmholtz plane” and are predominantly polarized solvent molecules, with some ions that have lost their solvation shells. Past this is a layer, called the “outer Helmholtz plane”, which is composed of solvated ions of opposite charge to the electrode. This separation of charges at the electrode–electrolyte interface is known as the “electric double-layer effect” and is the means by which electrical energy is stored. Because the potential drop is largely confined to this region, which ranges from 0.1 to 10 nm, the corresponding electric field strength is in the thousands of kV per mm, allowing supercapacitors to store up 10000 times more charge per unit mass than electrolytic capacitors. Figure 1: Illustration of double layer formation and electric potential distribution in one electrode of a charged supercapacitor. The double-layer mechanism implies that the amount of charge stored per unit voltage (i.e., the capacitance) is proportional to the interfacial area of the electrodes. Thus, supercapacitor electrodes tend to be made from extremely porous materials whose surface areas can be in excess of 1000 m2 (about one-fifth the size of a football field) per gram of material. Some specially designed supercapacitors, called pseudocapacitors, may also store charge via rapid redox reactions that do not result in any phase transition of the electrode material. (See page on pseudocapacitance.) Pseudocapacitors offer energy densities around 30 Wh/kg, better than supercapacitors based only on double-layer capacitance but still much less than lithium-ion batteries. Supercapacitors can also act as a power buffer, mitigating the effects of high peaks and brief interruptions of current. They have been used as backup power supplies for computer memory modules and pitch control system in wind turbine actuators. [9,10] In addition, they have been proposed as buffers for the high pulse power that is drawn by some electric vehicles while charging, which would otherwise reduce the efficiency of the grid. J. Bird, Electrical Circuit Theory and Technology, Routledge, 2014. A.K. Singh, D. Sarkar, G.G. Khan, K. Mandal, Unique hydrogenated Ni/NiO core/shell 1D nano-heterostructures with superior electrochemical performance as supercapacitors, Journal of Materials Chemistry A. 1 (2013) 12759. doi:10.1039/c3ta12736b. H.D. 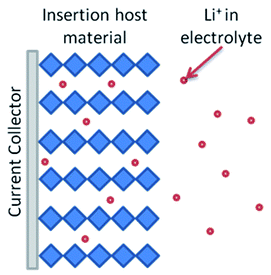 Abruna, Y. Kiya, J.C. Henderson, Batteries and electrochemical capacitors, Physics Today. 61 (2008) 43–47. doi:10.1063/1.3047681. P. Weissler, Mazda introduces supercapacitor-type regenerative braking – SAE International, (2013). http://articles.sae.org/11845/ (accessed June 15, 2016). D. Levitan, Transit Systems Have Started to Save Lots of Energy, Scientific American. (2014). http://www.scientificamerican.com/article/braking-trains-coupling-with-energy-storage-for-big-electricity-savings/ (accessed June 15, 2016). H. Liu, Z. Wang, S. Qiao, Y. Liu, Improvement of engine cold start capability using supercapacitor and lead-acid battery hybrid, in: Twenty-Third Annual IEEE Applied Power Electronics Conference and Exposition, 2008. APEC 2008, 2008: pp. 668–675. doi:10.1109/APEC.2008.4522793. D. Terrones, Tecate Group – Markets & Applications. – Military/Aerospace – Radar, (n.d.). https://www.tecategroup.com/markets/applications/?market=Military-Aerospace&application=Radar (accessed June 15, 2016). Nippon Chemi-Con Corporation, Nippon Chemi-Con, Stanley Electric and Tamura announce: Development of “Super CaLeCS”, an environment-friendly EDLC-powered LED Street Lamp, (2010). http://www.chemi-con.co.jp/e/company/pdf/20100330-1.pdf (accessed June 15, 2016). Cooper Bussmann, 5.5V Supercapacitors for Hold-Up & Memory Back-Up Applications, (2007). http://www1.cooperbussmann.com/pdf/76833af0-e7e1-47d7-8e43-819f008e35a1.pdf (accessed June 15, 2016). Maxwell Technologies | Wind Pitch Control Solutions, Maxwell Technologies. (n.d.). http://www.maxwell.com/solutions/power-grid/wind-pitch-control (accessed June 15, 2016). M. Farhadi, O.A. Mohammed, Real-Time Operation and Harmonic Analysis of Isolated and Non-Isolated Hybrid DC Microgrid, IEEE Transactions on Industry Applications. 50 (2014) 2900–2909. doi:10.1109/TIA.2014.2298556. Figure 1: Illustration of redox pseudocapacitance. Redox pseudocapacitance: This occurs when ions adsorb on or near the surface of the electrode with an accompanying transfer of electron(s). One example of a system that displays such behavior is hydrous ruthenium dioxide (RuO2*nH2O) in acidic solution. In this example, the charge storage mechanism is explained by the simultaneous insertion of electrons and protons into the structure, causing the oxidation state of ruthenium to shift between Ru4+, Ru3+, and Ru2+. Experimentally, electrodes made of hydrous ruthenium oxide mixed with amorphous carbon and coated on graphite have achieved a specific capacitance as high as 1340 F/g at a voltage sweep rate of 25 mV/s, very close to the theoretical capacitance value. Figure 2: Illustration of intercalation pseudocapacitance. Intercalation pseudocapacitance: This occurs when ions penetrate into voids in a redox-active electrode material with an accompanying charge transfer. This is similar in principle to a lithium-ion battery, with the distinction that no phase transformation occurs in the host material. In this case, the concept of “capacity”, as measured in milliamp-hours and commonly applied to lithium-ion batteries, is more meaningful than “capacitance” as measured in farads. One example is illustrated with the orthorhombic polymorphs of Nb2O5 (T-Nb2O5) and V2O5, both of which form layered sheet structures. [4–6] When a lithium-based electrolyte is used, Li+ ions can diffuse rapidly through the interlayer voids and bind reversibly to the oxide, losing or gaining an electron in the process. In the case of T-Nb2O5, the maximum amount of lithium that can be accommodated is x = 2. This corresponds to a theoretical capacity of ~200 mAh/g; 130 mAh/g (65% of theoretical) has been attained experimentally at a rate of 10C (meaning that the current would discharge or charge the entire theoretical capacity in one-tenth of an hour or 6 minutes). In comparison, most commercial lithium-ion batteries cannot be charged at a rate over 3C (discharging / charging the theoretical capacity in one-third of an hour) without significant reduction in capacity and service life. V. Augustyn, P. Simon, B. Dunn, Pseudocapacitive oxide materials for high-rate electrochemical energy storage, Energy & Environmental Science. 7 (2014) 1597. doi:10.1039/c3ee44164d. W. Dmowski, T. Egami, K.E. Swider-Lyons, C.T. Love, D.R. Rolison, Local Atomic Structure and Conduction Mechanism of Nanocrystalline Hydrous RuO2 from X-ray Scattering, J. Phys. Chem. B. 106 (2002) 12677–12683. doi:10.1021/jp026228l. 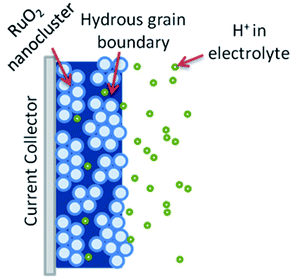 C.-C. Hu, W.-C. Chen, K.-H. Chang, How to Achieve Maximum Utilization of Hydrous Ruthenium Oxide for Supercapacitors, J. Electrochem. Soc. 151 (2004) A281–A290. doi:10.1149/1.1639020. V. Augustyn, J. Come, M.A. Lowe, J.W. Kim, P.-L. Taberna, S.H. Tolbert, H.D. Abruña, P. Simon, B. Dunn, High-rate electrochemical energy storage through Li+ intercalation pseudocapacitance, Nat Mater. 12 (2013) 518–522. doi:10.1038/nmat3601. M. Liu, C. Yan, Y. Zhang, Fabrication of Nb2O5 Nanosheets for High-rate Lithium Ion Storage Applications, Scientific Reports. 5 (2015) 8326. doi:10.1038/srep08326. Z. Tong, H. Xu, G. Liu, J. Zhao, Y. Li, Pseudocapacitive effect and Li+ diffusion coefficient in three-dimensionally ordered macroporous vanadium oxide for energy storage, Electrochemistry Communications. 69 (2016) 46–49. doi:10.1016/j.elecom.2016.05.017. Most mass-produced, commercial supercapacitors today use activated carbon as their primary component. Activated carbon can be derived from many different sources that have a high carbon content, including charcoal, coconut shells, and wood. Most commonly, it is produced by heat-treating the starting material in inert gas at 600-900°C to convert it to carbon, then exposing it to superheated steam in a similar temperature range. This second process etches the carbon surface to create an abundance of small, low-volume pores (typically less than 10 nm in diameter). This porosity imparts an enormous specific surface area to the material, which can be in excess of 1000 m2 per gram. Furthermore, activated carbon features a large electrical conductivity due to the delocalized π-electrons from sp2 bonded atoms. These properties make it well suited for double-layer capacitance applications. A typical off-the-shelf supercapacitor based on activated carbon and organic liquid electrolyte has a specific capacitance (i.e., the capacitance per unit mass of electrochemically active material) of 25-30 F/g. Other materials that have been investigated for double-layer capacitance are vertically aligned carbon nanotubes, porous 3D assemblies of graphene sheets, and carbon aerogels derived from organic polymers. Like activated carbon, these forms of carbon have very high specific surface area and electrical conductivity to maximize charge storage and rate capability. Vertical alignment of the carbon nanotubes, in particular, is hypothesized to create better conduction pathways for electrons and diffusion pathways for ions in the electrolyte. Supercapacitors relying on pseudocapacitance as the primary charge storage mechanism tend to be based on transition metal oxides, such as RuO2, MnO2, Nb2O5, V2O5, and Fe3O4. These can be synthesized by a variety of methods, including sol-gel, co-precipitation, and hydrothermal technique, and may be processed into composites with the forms of carbon described above to improve electron transport properties as well as add double-layer capacitance. In addition to the active material that is responsible for double-layer capacitance and pseudocapacitance, small amounts of nonactive additives may be present in electrodes as well. Usually, these consist of: an inert polymer binder, which helps particles of the active material adhere to one another to improve the mechanical integrity of the electrode; and a “carbon black”, which is a powdery form of carbon produced from incomplete combustion of petroleum products and improves electrical conductivity through the bulk of the electrode. The carbon black is especially important for pseudocapacitive materials which have negligible conductivity on their own. Commercially, supercapacitors are often prepared in a coin cell form factor, similar to lithium-ion batteries. Electrode preparation involves milling the active material into fine particles, followed by thorough grinding of the active material, binder, and carbon black into a paste or slurry, depending on whether the binder is in the form of a solid or emulsion. The mixture is then directly placed or blade-coated onto a metallic foil that serves as a current collector—i.e., a conduit for electrons between the electrode and the external circuit. Electrolyte is introduced, an ion-permeable separator sheet is placed in between the two electrodes, and the cell is hermetically sealed with a crimper. Separator materials include cellulose, polypropylene, fiberglass, and glass wool. Figure 2: Schematic diagram of coin cell assembly. The electrolyte can be an aqueous solution such as sulfuric acid or potassium hydroxide, an organic solution such as tetraethylammonium tetrafluoroborate in acetonitrile, or an ionic liquid such as imidazolium. The choice of electrolyte is as important as the choice of active material in determining the capacitance, resistance, operating voltage, and temperature range of the supercapacitor. Aqueous electrolytes offer the highest conductivity and therefore the highest power capability, but can only be operated up to about 1.2 V, above which water breaks down. This severely limits the amount of energy that can be stored. On the other hand, electrolytes in organic solvents can be operated up to ~2.7 V, but conductivity can be an order of magnitude lower, resulting in power loss. Additionally, organic electrolytes tend to be expensive, toxic, and flammable. Ionic liquids, which are basically room-temperature molten salts, feature the highest limit of operating temperature (~300°C) and voltage (~4.5 V), and are non-flammable, but are also very expensive. V.V.N. Obreja, A. Dinescu, A.C. Obreja, Activated carbon based electrodes in commercial supercapacitors and their performance, International Review of Electrical Engineering. 5 (2010) 272–282. M. Saghafi, F. Mahboubi, S. Mohajerzadeh, R. Holze, Preparation of vertically aligned carbon nanotubes and their electrochemical performance in supercapacitors, Synthetic Metals. 195 (2014) 252–259. doi:10.1016/j.synthmet.2014.06.012. Z.A. Noorden, S. Sugawara, S. Matsumoto, Noncorrosive separator materials for electric double layer capacitor, IEEJ Trans Elec Electron Eng. 9 (2014) 235–240. doi:10.1002/tee.21961. Q. Gao, Optimizing carbon/carbon supercapacitors in aqueous and organic electrolytes, PhD thesis, Université d’Orléans, 2013. https://tel.archives-ouvertes.fr/tel-00872080/document (accessed June 11, 2016). Where I = current, Q = charge, V = voltage, C = capacitance, and t = time. This means that if the voltage is swept linearly over time, then the corresponding current will be of constant magnitude, positive when the voltage is increasing and negative when the voltage is decreasing. In reality, deviations from rectangularity will occur due to series resistance in the system, which may be associated with electron transport in the electrode material, contacts between the electrode and terminals of the device, and/or diffusion of ions in the electrolyte. Such resistances mean that the current cannot respond instantaneously to changes in the direction of the voltage sweep, causing two of the corners in the voltammogram to be rounded-off (Figure 1B), with the rounding becoming more pronounced as the sweep rate is increased. At fast enough sweep rates, the interfacial double layer will not have sufficient time to form at all, resulting in negligible capacitance. Examples of ideal (A) and non-ideal (B, C) CV curves. Such redox reaction cause an increase in current above that which is needed to charge the interfacial double layer, but they do not contribute to capacitance. This shows up in the voltammogram as a “sharpening” of two of the corners (Figure 1C). Where μ is the scan rate, m is the mass of active material, and ΔV is the potential window. Galvanostatic cycling is the experimental “opposite” of cyclic voltammetry: the supercapacitor is charged and discharged between two specified voltage points at a constant applied current. This type of operation more accurately reflects real-world performance. Ideally, the resulting plot of voltage over time is linear, as predicted by Equation 1, with alternating positive and negative slope (Figure 2A). Deviations from linearity may occur for the same reasons discussed above, with series resistance causing the cell voltage to drop rapidly (“IR drop”, Figure 2B) when switching from charging to discharging. In addition, electrolyte degradation or other redox reactions (such as from pseudocapacitance) will yield plateaus or inflection points on the voltage plot (Figure 2C). Furthermore, all real supercapacitors exhibit self-discharge, where a small amount of current is conducted when the device is in a charged state but not connected to any external load. If the cell is shorted, such as by inadvertent direct contact of the electrodes, the parasitic current may be significant. This causes the cell voltage to drop faster than expected during discharge and is more noticeable at low applied current densities due to the higher relative magnitude of the parasitic current. Figure 2: Examples of ideal (A) and non-ideal (B, C) galvanostatic charge-discharge curves. where Cs is the specific capacitance, I is the constant discharge current, m is the mass of active material, ΔV is the potential window, and Δt is the time elapsed in the range of ΔV. Analogous to cyclic voltammetry, galvanostatic cycling can be conducted over a range of current densities to gauge rate capability. Electrochemical Impedance Spectroscopy (EIS) is perhaps the most comprehensive electrochemical analysis technique. This involves applying an alternating voltage to the device over a wide range of frequencies and measuring the amplitude and phase shift of the resulting current. 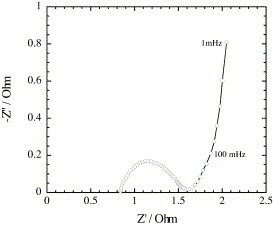 From these measurements at each frequency, the impedance is calculated, and is presented in the form of a Nyquist plot (which plots the imaginary component of impedance against the real component) or a Bode plot (which shows the magnitude of impedance and phase shift versus frequency). The interpretation of this data is beyond the scope of this website, but it can be fit to different equivalent-circuit models of supercapacitors (of which there are many). From the best fit, specific parameters such as the double-layer capacitance, series resistance, charge transfer resistance (resistance associated with redox reactions at the electrode–electrolyte interface, if pseudocapacitance is significant), and diffusion-related resistance can be extracted. In addition, the use of many different frequencies in the applied voltage allows for studying the rate capability of the device—i.e., how quickly it can be cycled without significant capacity loss. B. Hsia, Materials Synthesis and Characterization for Micro-supercapacitor Applications, PhD thesis, University of California, Berkeley, 2013. http://digitalassets.lib.berkeley.edu/etd/ucb/text/Hsia_berkeley_0028E_13892.pdf (accessed June 15, 2016). Y.-Z. Wei, B. Fang, S. Iwasa, M. Kumagai, A novel electrode material for electric double-layer capacitors, Journal of Power Sources. 141 (2005) 386–391. doi:10.1016/j.jpowsour.2004.10.001. Guozhong Cao (MSE) is studying modified porous carbon for supercapacitor electrodes. These materials are obtained by freeze-drying organic polymeric gels, followed by high-temperature pyrolysis in an inert atmosphere. One recent paper presents on the co-doping of such carbon materials with sulfur and nitrogen by mixing phosphorus pentasulfide with the gel precursors. The hypothesis is that the foreign elements can lead to higher surface charge density, inducing pseudocapacitive reactions in addition to double-layer capacitance. A specific capacitance of 103.5 F/g was achieved for the doped aerogel, 43.5% higher than that of pristine porous carbon. The sulfur and nitrogen dopants were also found to improve the electrocatalytic activity of the host carbon for the oxygen reduction reaction (ORR), the key reaction for fuel cells. Peter Pauzauskie (MSE) is also investigating porous carbons derived from organic gels, but through the process of supercritical drying as opposed to freeze drying. In particular, the gels are made from polymerizing resorcinol and formaldehyde using a novel acid-catalyzed technique in acetonitrile that accelerates the gelation by a factor of >10. Graphene oxide (GO), an oxidized and exfoliated derivative of graphite, can be introduced to the gel precursors to create (following pyrolysis) a covalently cross-linked assembly of graphene, a two-dimensional structure of carbon atoms bonded in a hexagonal lattice. This is a promising supercapacitor material considering the extraordinary electron transport properties of graphene, which could minimize impedance in the device and enhance its rate capability. These hypotheses have been confirmed by constant-current discharge tests and impedance spectroscopy. Christine Luscombe (MSE / Chemistry) is studying conductive hyperbranched polymers for negative electrode materials for asymmetric supercapacitors (i.e., where the two electrodes are made of different materials). Conductive polymers are redox-active, offering pseudocapacitance, and can be synthesized at lower cost than pseudocapacitive metal oxides such as RuO2 owing to the relative abundance of the precursor materials. In a recent study, supercapacitor electrodes based on polymers with triphenylamine cores and naphthalene diimide terminal units were limited to modest capacitance (< 22 F/g), but exhibited less than 10% capacity fade over 500 cycles—on par with existing battery technologies. Y. Zhou, R. Ma, S.L. Candelaria, J. Wang, Q. Liu, E. Uchaker, P. Li, Y. Chen, G. Cao, Phosphorus/sulfur Co-doped porous carbon with enhanced specific capacitance for supercapacitor and improved catalytic activity for oxygen reduction reaction, Journal of Power Sources. 314 (2016) 39–48. doi:10.1016/j.jpowsour.2016.03.009. M.B. Lim, M. Hu, S. Manandhar, A. Sakshaug, A. Strong, L. Riley, P.J. Pauzauskie, Ultrafast sol–gel synthesis of graphene aerogel materials, Carbon. 95 (2015) 616–624. doi:10.1016/j.carbon.2015.08.037. D.F. Zeigler, S.L. Candelaria, K.A. Mazzio, T.R. Martin, E. Uchaker, S.-L. Suraru, L.J. Kang, G. Cao, C.K. Luscombe, N-Type Hyperbranched Polymers for Supercapacitor Cathodes with Variable Porosity and Excellent Electrochemical Stability, Macromolecules. 48 (2015) 5196–5203. doi:10.1021/acs.macromol.5b01070. This page was last modified on 9 November 2016, at 15:39.